We feel that a charger should be simple to use, quick to charge, and reasonably priced. With this in mind, we offer the AME4. 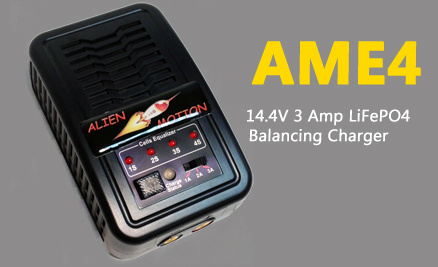 This is a 3 amp LiFePO4 balancing charger ideally suited for Alien Motion batteries. Periodic balancing ensures battery health and full capacity. It is designed to ensure the health and full state of charge of your battery. 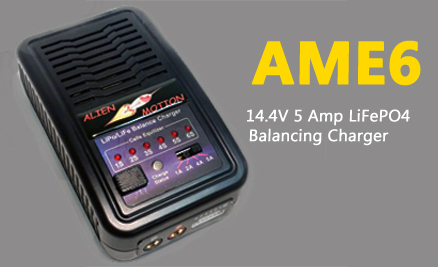 The AME6 offers all the advantages of our AME4, but charges at a 5 amp rate. This will provide a 40% faster charge time, which will be better suited for our larger batteries such as the AM12/AM16/AM22. Like the smaller AME4, it balances during the charge to ensure the health and full state of charge of your battery. Alien Motion starter batteries offer high performance Lithium Ferrous (LiFePO4) technology for your motorized vehicles. Our unique internal chemistry gives our product outstanding starting performance with a greater energy density almost four times greater than an average lead acid battery. Alien Motion starter batteries exhibit a very low rate of self discharge allowing for a longer shelf life and durability. Our batteries provide all of this, while also being environmentally friendly. Alien Motion, bringing you "Out of this world technology!" © 2013 Star Motion LLC. All Rights Reserved.